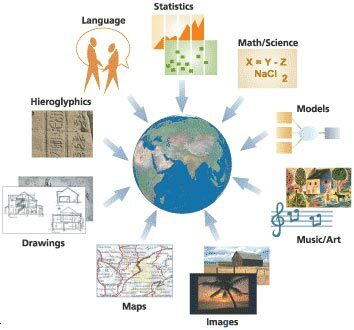 Geographic Information System (GIS) is a computer based information system used to digitally represent and analyse the geographic features present on the Earth’ surface and the events (non-spatial attributes linked to the geography under study) that taking place on it. The meaning to represent digitally is to convert analog (smooth line) into a digital form. Every object present on the Earth can be geo-referenced”, is the fundamental key of associating any database to GIS. Here, term ‘database’ is a collection of information about things and their relationship to each other, and ‘geo-referencing’ refers to the location of a layer or coverage in space defined by the co-ordinate referencing system. Work on GIS began in late 1950s, but first GIS software came only in late 1970s from the lab of the ESRI. Canada was the pioneer in the development of GIS as a result of innovations dating back to early 1960s. Much of the credit for the early development of GIS goes to Roger Tomilson. Evolution of GIS has transformed and revolutionized the ways in which planners, engineers, managers etc. conduct the database management and analysis. A Geographic Information System is a computer based system which is used to digitally reproduce and analyse the feature present on earth surface and the events that takes place on it. In the light of the fact that almost 70% of the data has geographical reference as its denominator, it becomes imperative to underline the importance of a system which can represent the given data geographically. Hence GIS is looked upon as a tool to assist in decision-making and management of attributes that needs to be analysed spatially. Through technology’s ability to carry out spatial operations, linking data sets together. However there is another way to describe GIS by listing the type of questions the technology can (or should be able to) answer. Location, Condition, Trends, patterns, Modelling, Aspatial questions, Spatial questions. There are five type of questions that a sophisticated GIS can answer: Location What is at………….? Patterns What spatial patterns exists…………..? This question is more sophisticated. One might ask this question to determine whether landslides are mostly occurring near streams. It might be just as important to know how many anomalies there are that do not fit the pattern and where they are located. What if…” questions are posed to determine what happens, for example, if a new road is added to a network or if a toxic substance seeps into the local ground water supply. Answering this type of question requires both geographic and other information (as well as specific models). GIS permits spatial operation. What’s the average number of people working with GIS in each location?” is an aspatial question – the answer to which does not require the stored value of latitude and longitude; nor does it describe where the places are in relation with each other. How many people work with GIS in the major centres of Delhi” OR ” Which centres lie within 10 Kms. of each other? “, OR ” What is the shortest route passing through all these centres”. These are spatial questions that can only be answered using latitude and longitude data and other information such as the radius of earth. Geographic Information Systems can answer such questions. 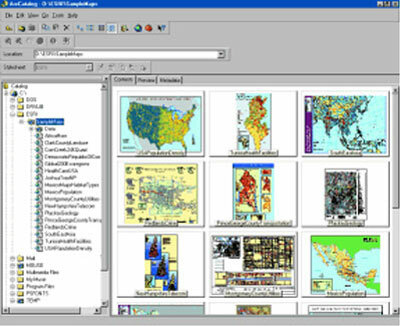 The Database View: A GIS is a unique kind of database of the world-a geographic database (geodatabase). It is an “Information System for Geography.” Fundamentally, a GIS is based on a structured database that describes the world in geographic terms. 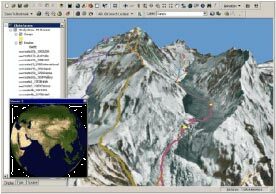 The Map View: A GIS is a set of intelligent maps and other views that show features and feature relationships on the earth’s surface. Maps of the underlying geographic information can be constructed and used as “windows into the database” to support queries, analysis, and editing of the information. This is called geovisualization. 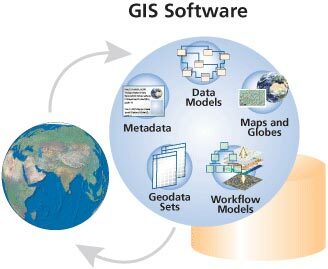 The Model View: A GIS is a set of information transformation tools that derive new geographic datasets from existing datasets. These geoprocessing functions take information from existing datasets, apply analytic functions, and write results into new derived datasets. Together, these three views are critical parts of an intelligent GIS and are used at varying levels in all GIS applications. GIS is much more than mapping software. Maps are only one of three views of a GIS. When deployed with a clear strategy, GIS is a technology that can change an organization fundamentally and positively. Most computer technology is designed to increase a decision-maker’s access to relevant data. GIS goes beyond mining data to give you the tools to interpret that data, allowing you to see relationships, patterns, or trends intuitively that are not possible to see with traditional charts, graphs, and spreadsheets. More than that, a GIS lets you model scenarios to test various hypotheses and see outcomes visually to find the outcome that meets the needs of all the stakeholders. For example, a retail manager looking to build a new store can analyze consumer demographics and the locations of competitors in relation to potential locations in a spreadsheet view. GIS lets that manager visualize potential locations on a map along with drive-time analysis, environmental concerns such as wetlands or protected species that might hamper construction, or any number of siting criteria that would be too cumbersome to comprehend otherwise. GIS can provide you with powerful information-not just how things are, but how they will be in the future based on changes you apply. 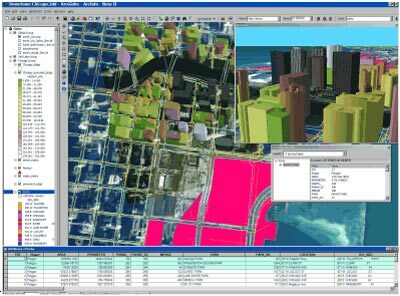 GIS is, therefore, about modeling and mapping the world for better decision making. GIS tools range from simple contact mapping tools to consumer analysis to complex enterprise systems that are part of an organization’s overall enterprise resource planning infrastructure. Used wisely, it can be a transformational tool for your organization. 70% of the information has geographic location as it’s denominator making spatial analysis an essential tool. The proliferation of GIS is explained by its unique ability to assimilate data from widely divergent sources, to analyse trends over time, and to spatially evaluate impacts caused by development. For an experienced analyst, GIS is an extension one’s own analytical thinking. The system has no in-built solutions for any spatial problems; it depends upon the analyst. The adage “better information leads to better decisions” is as true for GIS as it is for other information systems. A GIS, however, is not an automated decision making system but a tool to query, analyze, and map data in support of the decision making process. GIS technology has been used to assist in tasks such as presenting information at planning inquiries, helping resolve territorial disputes, and siting pylons in such a way as to minimize visual intrusion. Not only in the previously mentioned fields but also in the social sciences GIS can prove extremely useful. Besides the process of formulating scenarios for an Environmental Impact Assessment, GIS can be a valuable tool for sociologists to analyze administrative data such as population distribution, market localization and other related features. Many organizations that have implemented a GIS have found that one of its main benefits is improved management of their own organization and resources. Because GIS has the ability to link data sets together by geography, it facilitates interdepartmental information sharing and communication. By creating a shared database one department can benefit from the work of another–data can be collected once and used many times. It consists of the computer system on which the GIS software will run. The choice of hardware system range from 300MHz Personal Computers to Super Computers having capability in Tera FLOPS. The computer forms the backbone of the GIS hardware, which gets its input through the Scanner or a digitizer board. Scanner converts a picture into a digital image for further processing. The output of scanner can be stored in many formats e.g. TIFF, BMP, JPG etc. A digitizer board is flat board used for vectorisation of a given map objects. Printers and plotters are the most common output devices for a GIS hardware setup. GIS software provides the functions and tools needed to store, analyze, and display geographic information. GIS softwares in use are MapInfo, ARC/Info, AutoCAD Map, etc. The software available can be said to be application specific. When the low cost GIS work is to be carried out desktop MapInfo is the suitable option. It is easy to use and supports many GIS feature. If the user intends to carry out extensive analysis on GIS, ARC/Info is the preferred option. For the people using AutoCAD and willing to step into GIS, AutoCAD Map is a good option. Data Geographic data and related tabular data can be collected in-house or purchased from a commercial data provider. The digital map forms the basic data input for GIS. Tabular data related to the map objects can also be attached to the digital data. A GIS will integrate spatial data with other data resources and can even use a DBMS, used by most organization to maintain their data, to manage spatial data. GIS users range from technical specialists who design and maintain the system to those who use it to help them perform their everyday work. The people who useGIS can be broadly classified into two classes. The CAD/GIS operator, whose work is to vectorise the map objects. The use of this vectorised data to perform query, analysis or any other work is the responsibility of a GIS engineer/user. And above all a successful GIS operates according to a well-designed plan and business rules, which are the models and operating practices unique to each organization. There are various techniques used for map creation and further usage for any project. The map creation can either be automated raster to vector creator or it can be manually vectorised using the scanned images. The source of these digital maps can be either map prepared by any survey agency or satellite imagery. 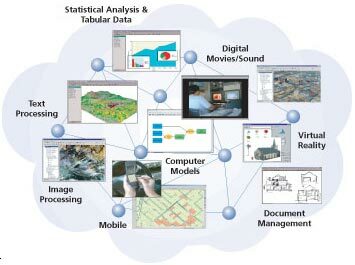 Computerized mapping and spatial analysis have been developed simultaneously in several related fields. The present status would not have been achieved without close interaction between various fields such as utility networks, cadastral mapping, topographic mapping, thematic cartography, surveying and photogrammetery remote sensing, image processing, computer science, rural and urban planning, earth science, and geography. 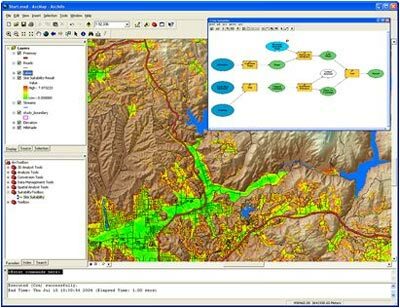 The GIS technology is used to assist decision-makers by indicating various alternatives in development and conservation planning and by modelling the potential outcomes of a series of scenarios. It should be noted that any task begins and ends with the real world. Data are collected about the real world. Of necessity, the product is an abstraction; it is not possible (and not desired) to handle every last detail. After the data are analysed, information is compiled for decision-makers. Based on this information, actions are taken and plans implemented in the real world. Different streams of planning Urban planning, housing, transportation planning architectural conservation, urban design, landscape. Street Network Based Application It is an addressed matched application, vehicle routing and scheduling: location and site selection and disaster planning. Natural Resource Based Application Management and environmental impact analysis of wild and scenic recreational resources, flood plain, wetlands, acquifers, forests, and wildlife. View Shed Analysis Hazardous or toxic factories siting and ground water modelling. Wild life habitat study and migrational route planning. Land Parcel Based Zoning, sub-division plans review, land acquisition, environment impact analysis, nature quality management and maintenance etc.